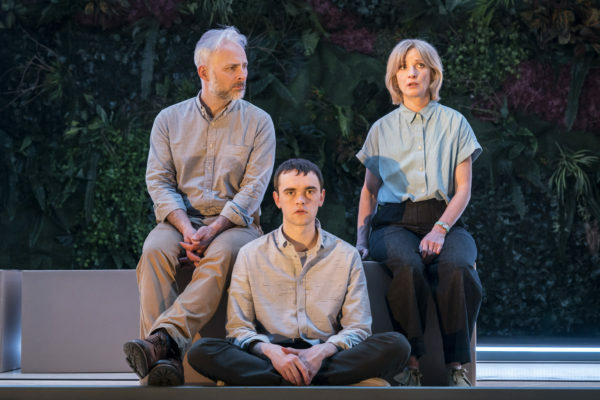 If Amazon Prime delivered families: Rosemary Waugh reviews Thomas Eccleshare’s new play about humanoids and parenting. ‘It could almost be a catalogue’ is how the play text describes the setting of Thomas Eccleshare’s Instructions for Correct Assembly. Which is neat, because that’s precisely the same thought that kept entering my mind when watching it. Specifically, Cai Dyfan’s set realises the interior design dreams of the Loaf or MADE* catalogues, where paired-back urban minimalism retains hints of aristo flourishes (wing back chairs with button detailing) and the type of horticulture that would in no way – NO WAY – ever involve the owner having to dig around in a bag of manure or scrape soil out from under a thumb nail. The Loaf and MADE universes are, like Dyfan’s set, predominantly white or softly, softly grey and punctuated with pastels or the occasional daring flash of retro mustard, teal or navy (those who wish to camouflage themselves against their own sofa could pop along to Oliver Bonas for an entirely complementary outfit). Jack Knowles’s lighting for the production reiterates this colour palette, flicking between spearmint, peach and red. In doing so, it spotlights (ha ha) how this aesthetic walks unnervingly close to being clinical. Choose the wrong ironic art or forget the bathroom succulents and you could find yourself living in a very posh hospital. It’s all so very wipe-clean. All of which is surely entirely deliberate. Hamish Pirie’s world premiere production places much of the action on or off a conveyer belt. Characters enter and exit scenes in exactly the same manner as inanimate possessions, and the symbolism is clear: this is the Modern Age (or, the post-Postmodern Age, or wherever it is that we’re currently at in that theoretical chronology). Everything can be Amazon Primed to the point where even new companions are just one click-and-collect away from being part of your life. And that’s where we find Harry (Mark Bonner) and Max (Jane Horrocks), piecing together and then learning to live with Jån (Brian Vernal), an advanced robotic humanoid. There are many perks to having a Jån around the house, mainly connected to being able to be able to control his speech and behaviour at the press of a button. If your Jån stops being the charming garden assistant merrily asking why a hydrangea is called a hydrangea** and instead says something inappropriately right wing about immigration, you can beep beep beep through to more palatably Guardian political viewpoints. It’s this notion of control, and the way successful commercial ventures make big money off our desire to manufacture a perfect environment, that Eccleshare’s play repeatedly returns to. The ‘catalogue’ interior is a metaphor for how attractive being able to buy an untainted, excruciatingly monitored lifestyle is. This is then pitted against the reality of existence as something stubbornly resistant to human attempts to regulate it, as it emerges that Jån is close to being a geminoid (an android resembling a real human), albeit one who can be made ‘better’ than the one he looks like. Instructions for Correct Assembly is best when least like a commentary on late stage capitalism and more about grief, regrets and love. Among a pile of reminders that your purchasing power is flaccid compensation for having no actual power, is one moment where a bought item – a train set – is not simply a cynical attempt to shape the life of your offspring, but equally about a genuine, if clumsy, wish to forge father-son relationships via a shared passion. In contrast, Pirie cleverly captures the parasitical version of parenthood when he stages a dinner party scene with only two plates of food among six guests, meaning the parents consistently nourish themselves quite literally from their children’s plates – often whilst inadvertently voicing how their stilted dreams have now been repackaged as the ‘chosen’ career path of their child. These brief instances where the complexity and sadness of love (I need you; I need you to need me; I need to be needed) introduce exactly the type of unfathomable, messy human emotion and error that can’t be bought or sold, according to the play’s recurrent idea. But they’re few and far between. Too often the production resembles the sleek, glossy 2D world it attempts to critique. Dyfan’s design is meticulous, and the performances are excellent, in particular from Vernal who never succumbs to being obviously robotic, yet manages to highlight how the behaviour of teenage boys can be unintentionally cyborg-like. Pirie, too, directs it with style, adding bits of robotic choreography and, as with the dinner party scene, amusing visual metaphors. But despite its insistent ache to be contemporary, relevant and full of the buzzy issues, its own checklist of symbolism remains largely unexplored or developed. Instead, it often repeats the same basic joke or idea, almost to the point of condescension. The ultimate frustration of the piece is that focusing on the excessive consumerism of the upper middle classes right now misses the point that the most successful commercial ventures capitalise on an existing anxiety, rather than invent one – meaning, the iPhone didn’t invent our need to be constantly in touch with people, it clocked into a fundamental human desire to avoid loneliness. The ‘issues’ the play deals with (nature vs. nurture, man vs. machine, commerce vs. free emotion) are not exclusively the scourge of a time when human-shaped things can be made using screws, but exactly the same ones that have existed since human-shaped things were first created from, well, screws. Instructions for Correct Assembly is on until 19 May at the Royal Court. Click here for more details. * I went on this website in order to make the comparison based on its tube advert, then ended up seriously considering buying some velvet cushions.